Transcription is a very specialized field that requires equally qualified specialists in the industry. You want a transcription service that provides expert transcription of your audio and video files, live events or meetings – in almost any language and file format. Why Choose ITC Transcription Services? ITC is a leading transcription service provider with experience in business, legal and medical transcription. 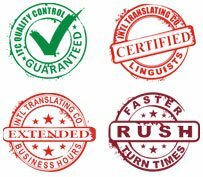 To make it more convenient for you, we can also include translation services, by transcribing recordings in one language into a written document in another language. You will receive the highest quality work at the lowest possible cost. Our ideal blend of talent, experience and infrastructure not only ensures the best quality and turnaround times, but you’ll also like working with us. You, the client, request transcription services via email, web portal or phone call. Your Project Manager collects the details, and communicates the timeline and costs. Next, the Project Manager selects the transcription team and assigns the work. When the transcribing is completed, the proofreader edits the document and rates the transcription. After that, Quality Assurance reviews the completed project and provides feedback to the Project Manager. For the last step, your Project Manager delivers your completed project that is on time, accurate, and at budget. Accurate transcription – every time. Your document is delivered when you need it. We are competitive – we strive to win and keep your trust. It is more cost-effective – we do the hiring and training. 24/7/365 customer support – so you get help when you need it. High Efficiency Reporting – we help you keep track of your projects.